Students will use their understanding of materials to answer questions about the gas all around us - air. Air is all around us, we can feel it and see the effects it has on objects in our environment. Air is made up of particles (very small pieces), just like other materials. Air is a mixture of gases which are vital for photosynthesis and respiration. 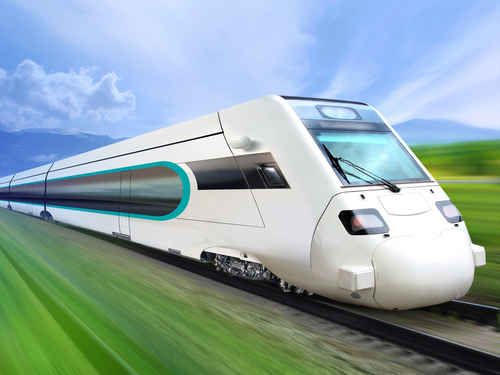 Battling against the wind uses lots of energy, so vehicle designers use shapes which reduce wind resistance, like this high-speed train. Air can also be a very useful material. 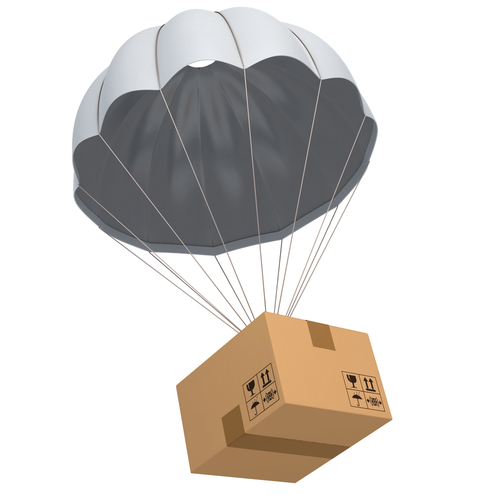 Without a parachute, objects would accelerate to the ground and smash. 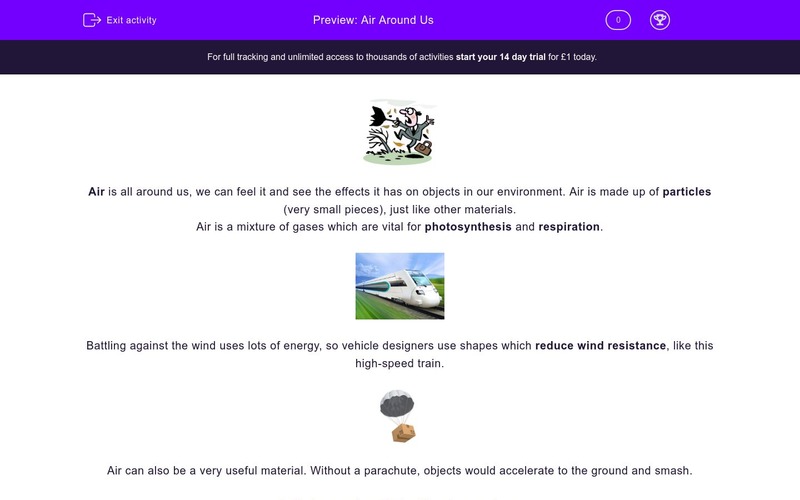 What kind of material is air? Air is a colourless gas, but we can see its effects. Which THREE of these movements are caused by air particles? Air is a useful material. Which THREE of these are examples of how we use air? 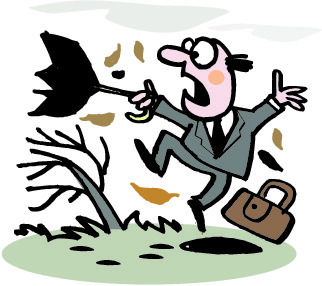 Air is used to give objects shape, and act a 'shock absorber' . Which THREE of these are good examples of that? Which THREE of these contain trapped air which makes them soft and light? Air plays an important role in the water cycle. Water from seas and lakes changes into vapour by the action of wind and warmth. What is the scientific name for this process? Sam and Kelly fill a beaker to the top with dry sand. Kelly says: "The spaces between the sand grains are filled by air." Sam says:"The sand grains completely fill the beaker." Kelly decides to show Sam that the sand is mixed with air in the beaker. What material could Kelly add to the beaker to test her idea? Kelly decides to help Sam understand how the beaker contains a mixture of sand and air. She fills another beaker with a mixture of small dice and marbles. What is this kind of scientific enquiry called? Sam wants to show that air is a material because it has a mass, that means that it can be weighed. He hangs an identical ballon on each arm of a balance to show that they weigh the same. What must he do now to show that air can be weighed, that it has a mass? Although an aeroplane flies through the air, it uses energy to work against the air and gravity, because it is very heavy. Shooting stars are in space. There is no air in space! Wind and breeze speeds up the process of evaporation -liquid changing to a gas. Clothes dry much quicker on a dry, windy day. Imagine riding a bicycle with solid tyres, or kicking a solid football! Ouch! Sand grains are irregular shapes which leave gaps between them. These spaces are filled with air when the sand is dry. Soil also contains air. Kelly pours water into the beaker. Even though the beaker looks 'full' she notices the bubbles of air leaving the surface of the sand as the water now fills the gaps between the grains. In science using models can help us to explain what is happening when things are too small to be seen. The balloon filled with air weighs more than the 'empty' balloon and will pull the balance arm down.